The Street Basketball Association is currently comprised of 12 teams located in major cities throughout the United States and 2 SBA All-Star Teams We are anticipating the addition of SBA franchises in the 30 largest urban markets throughout the country. The SBA is constantly reviewing potential individuals and groups interested in franchise ownership. SBA players on these teams consist of current and former professional players, former NCAA players, and street ball legends. We have concentrated on developing these players so that they might one day be able to play in the NBA or another professional league as well as provide the highest level of basketball for our audiences. As the first professional street basketball league, the SBA will give street ball players an opportunity to showcase their talents for scouts, agents, coaches, and fans during summer months. 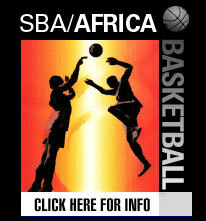 SBA players and teams will become liaisons for the league and the game of basketball in an attempt to give basketball back to its roots and to make a positive impact in their communities. SBA players are professional ball players who have earned iconic status on the streets and/or professional leagues throughout the U.S. and the world and been featured on ESPN Street Ball, ESPN City Slam, Nike BattleGrounds, AND 1 Tour, Hoops TV, NBA TV, MTV, EBC Rucker Park (NYC), Goodman League/Barry Farms (Washington DC), Venice Beach (LA), Slam Magazine, Dime Magazine, Sports Illustrated, and hundreds of Street Ball DVD's. As the business of basketball continues to prosper, the SBA is determined to be community-based, allowing fans the opportunity to experience some of the most competitive, dazzling, artistic, and innovative style of basketball in a safe and affordable family atmosphere. 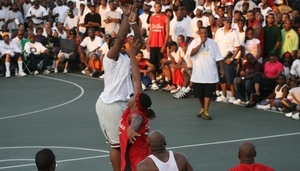 The SBA League is comprised of the top 10-15 players from their home cities to compete against other cities throughout the United States and abroad. We will supply a demand for highly entertaining and competitive, professional basketball during the "off-season" summer months, provide a platform for players to showcase their talents, create jobs for players, and most importantly return basketball back to its communities and roots. The SBA's catch phrase says it all "WE GOT OUR FIVE...GET YOURS!" The SBA is pursuing a national television contract to allow fans worldwide the rare opportunity to experience some of the most dazzling and unparalleled street-ball players and team performances available anywhere. 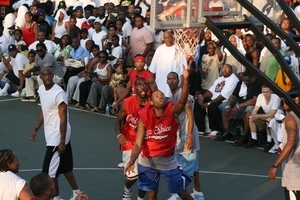 During league games, the SBA intends to create an atmosphere that will surpass both the Rucker League (New York) and the Urban Coalition (Washington, D.C.). The SBA entertain crowds with players displaying vicious killer crosses, behind the neck no look passes, and 720 degree slams while our DJ mixes the latest hip-hop beats. Up and coming and current top 40 artists will provide the audience with a sample of new live music to help enhance the overall SBA experience.